On Friday at the Affordable Music store in Dillon, shop owner Gary Koenig flips through some of the limited-edition records â singles and full albums â that he will have for sale today in recognition of National Record Store Day, a nationwide celebration of independently owned record stores. Koenig's is the only one still operating in Summit County. Info: A day honoring independently owned record stores across the US puts special, limited-edition records for sale into those stores. In Dillon, Affordable Music has more than 100 vinyl records available today. “These are things you won’t find in bix-box stores,” said Gary Koenig, owner of Affordable Music. Twenty-five years ago, Bill Clinton had unseated George H. W. Bush for the U.S. presidency but not yet taken office, Duke was celebrating its buzzer-beating victory over the University of Kentucky in the NCAA men’s basketball championship and Nirvana and Michael Jackson had top-selling albums. 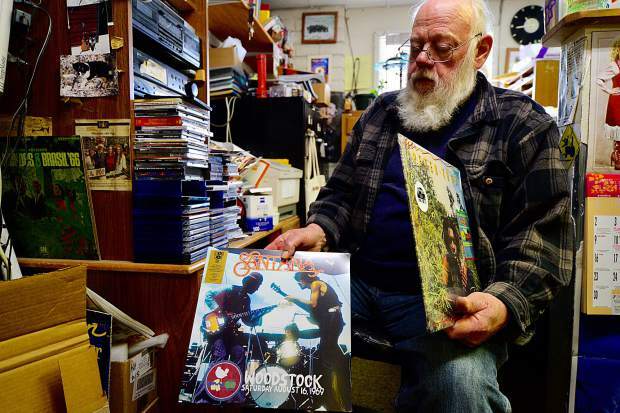 At the same time, Affordable Music, which remains the only independent record store still operating in Summit County today, first opened its doors for business, and as one might imagine, CDs were some of its hottest-selling items. On the eve of his biggest day of the year — National Record Store Day, which is being celebrated Saturday at numerous independently owned record stores across the country, including Koenig’s — he talked about why his eclectic little music shop, nestled in a not-too-prominent position next to Pug Ryan’s Brewery off Lake Dillon Drive, has survived where so many others have not. “I carry guitars and guitar strings now,” Koenig said before listing a number of other items now sold at his shop that didn’t use to be there. He added that vinyl records are making a comeback nowadays. With an often-asleep dog named Cody roaming the premises, the business still sells CDs and records from all music genres, but Koenig now offers guitars, in addition to guitar accessories, posters, stickers, ukuleles, plastic kazoos, hemp necklaces, incense sticks, glass smoking pipes, T-shirts and just about anything else that might make a buck. Inside the store, there are racks and racks of music to sort through — CDs and records — just past the instruments by the front door. The whole space has a way of holding one’s attention, and there’s a lot there to look through. At first, the organization of it all feels a bit cluttered, but upon further examination, it all seems to make sense. For Saturday, Affordable Music has lined up more than 100 limited-edition vinyl records for sale, ranging from $14 up to about $80, depending on the band and rarity of the album. Koenig said he had to sign a pledge not to price gouge anyone or sell the special, limited-edition vinyls online in order to offer the records at his store, but for the store, it was a promise worth making. “The last five years, it’s been the busiest day of the year for me hands down” Koenig said of National Record Store Day, agreeing that it’s somewhat like his Super Bowl.